I turned 30 a few days ago and as birthdays go, it was a relatively quiet one. Being quite introvert, I have never been a big fan of large birthday parties. While some friends urged me to have a big celebration, what with turning the big 3-0 and all, I am glad I celebrated the way I did, with my family, Alessandro, good food and plenty of cake and champagne. Alessandro was the first to arrive in Brussels. The first couple of days he was here, we would meet for lunch somewhere halfway between my office and my flat and in the evenings we would cook something from our trip to the farmers’ market earlier that week. Then, on Thursday, my sister arrived straight from her holidays in Greece and we celebrated her arrival with a wonderful spread of fresh bread, tomatoes, olive oil from her friends’ family’s trees in Greece and local varieties of cheese saltier than the Mediterranean. For my actual birthday on Friday, my parents came over from Germany. There was cake, a birthday card from my sister that made me cry (in a good way), my 94 year old grandmother who sang Happy Birthday to me over the phone, a wonderful birthday meal in a former leather factory here in Brussels and that was washed down with plenty of champagne and wine and a whole pile of presents to unwrap. Both Alessandro and my sister Helena stayed with me which meant my usual supply of fresh almond milk was finished rather more quickly (I wish I could, at least in part, blame Alessandro for this, but Helena and I managed to do that just by ourselves). Several batches of almond milk later and I was left with rather a lot of almond pulp. So the day my parents, Alessandro and Helena left, I baked a cake. 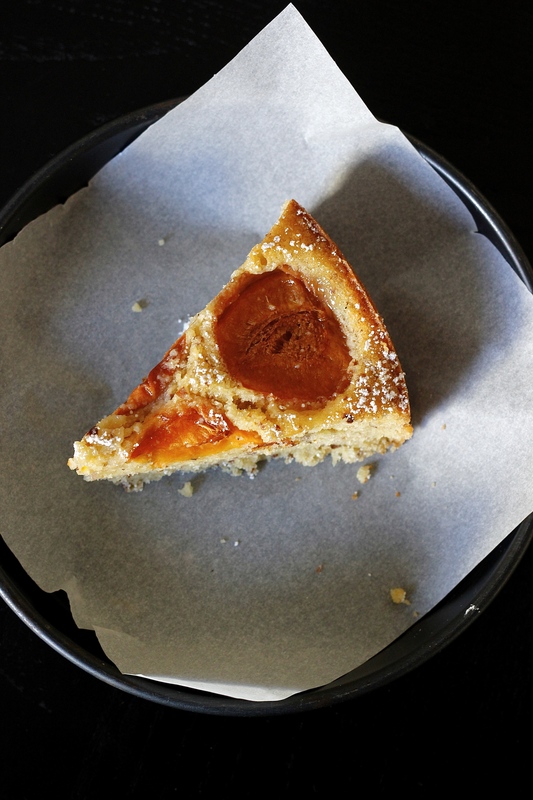 This apricot, almond and saffron cake. I am a firm believer that perfectly ripe and juicy stone fruits should not be fussed with too much and are best eaten raw. But, when it is cake you fancy (maybe because you have been going through a litre of homemade almond and there is a lot of leftover almond pulp), cake it shall be. Ever since making these saffron cookies and this saffron and polenta shortbread, I have been meaning to combine saffron and stone fruits like apricots or peaches and I am glad I finally did. It is a heavenly combination. Apricots can be bland and even a bit dry, but bake them into a clafoutis or a cake and even the blandest apricots will suddenly burst with flavour, their soft skins barely containing the sweet apricot juice, the flavour more tart than sweet and with a hint of muskiness that goes so well with saffron. Note: A couple of months ago I stopped buying milk and switched entirely to homemade almond milk. I make 500ml every 5 days or so which leaves me with 125g of almond pulp every time. I have been using a lot of the almond pulp to make grain-free granola with cacao nibs, brown sugar and sea salt (adapting the buckwheat granola recipe from Golubka’s new book). Nonetheless, slowly but surely, almond pulp is accumulating in my freezer. This cake is the perfect way for making a dent in my stash of almond pulp. 1. Pre-heat the oven to 180 degrees Celsius and grease a round cake pan. 2. In a large bowl beat the softened butter with the sugar until pale and fluffy, ca. 5 minutes. While continuing to beat on medium speed, add the egg yolks one by one, beating well after each addition. Stir in the goat yoghurt. 3. In a separate bowl whisk together the ground almonds, flour and the saffron. Fold into the butter, sugar and egg yolks. 4. In a clean bowl and using a clean hand whisk, beat the egg whites until firm. Fold 1/3 of the egg whites into the batter to loosen it before carefully folding in the rest, making sure not to deflate the batter too much. Pour the batter into the prepared cake pan and distribute the halved apricots over the top. Bake for ca. 60 minutes or until the cake is well rise and a knife inserted into the middle of the cake comes out clean. That is simply stunning – very impressive! Happy Birthday Sophia, I love the celebration you chose it sounds perfect as is that gorgeous cake. Just lovely! Happy birthday! The cake looks beautiful!